I’m one of those consumers who tends to boycott companies I find objectionable (though, let’s be honest, you gotta pick your battles! ), and sometime around 2010, I added American Apparel to that list. Reports of sexual harassment and questionable behavior from their Canadian founder and former CEO, Dov Charney, overrided the good things the company had going for it. Before my boycott, I’d only purchased some nail polish and a pair of sweatpants from the company, so it was a pretty easy thing to swear off any more of their merchandise. It’s quite a shame, though, because their nail polish was really nice. (I don’t think it’s sold anymore, as I can’t find it on their website any longer.) Of course, now that over the last few years American Apparel has ousted Charney and recovered from bankruptcy, it seems my personal boycott might be lifted—I’d need to do more research—though I’d only do it for their polish and not for leggings! Today’s Throwback Thursday was released in American Apparel’s original 18-shade collection—of all cream finishes!—launched in 2009. 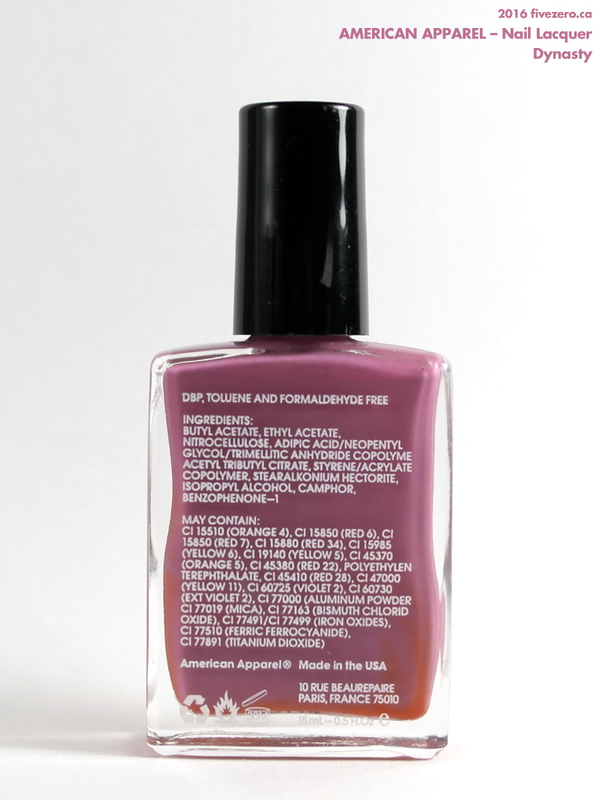 In 2010, the polishes were actually voluntarily recalled by the company due to the bottles being easily broken. (The formula itself was fine.) I’m not sure whether mine were bought before or after the recall; either way, none of my bottles have broken, and I think they’re amongst the nicest nail polish bottles I own. They’re sleek and minimal, and they just stack together so well! I feel a bit badly for wishing I’d gotten all of these at the time! American Apparel Nail Lacquer Launch, 2009. Office, Hunter, Hassid, Mount Royal, Passport Blue, Peacock. 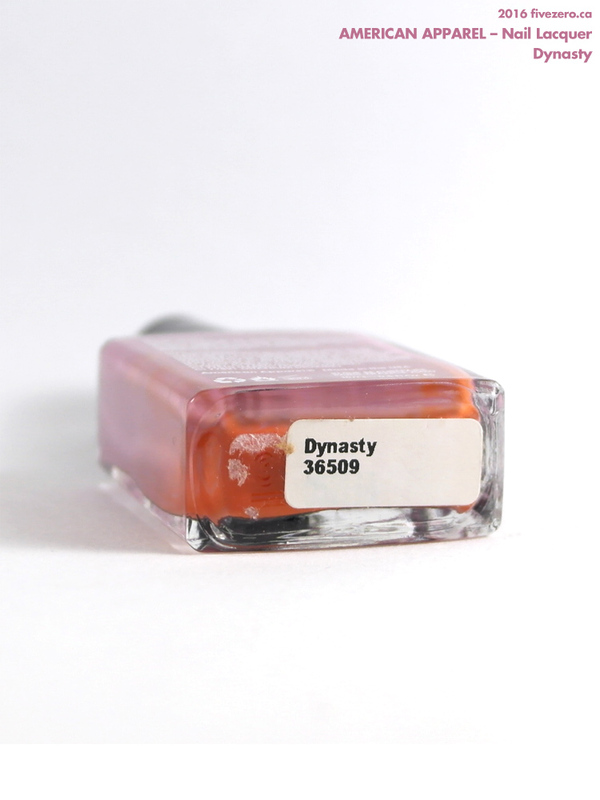 The polish I’m swatching today is Dynasty, a midtoned muted grape cream with a touch of mauve. Despite this polish’s age, it still applies quite beautifully. Two coats go on smoothly and give full opacity. American Apparel seems to have discontinued their Nail Lacquer, which is a shame as it was a pretty nice formula, well-packaged, and the colors were well conceived. 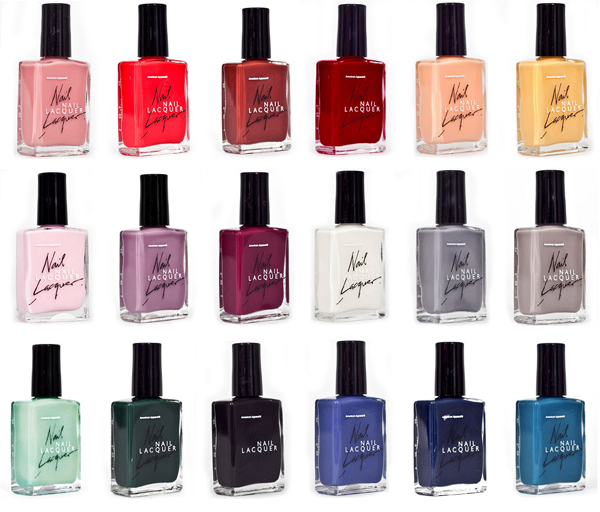 American Apparel Nail Lacquer retailed for US$6 (3-packs were available for $15) and were 0.5 US fl oz / 15 mL. It was free of toluene, formaldehyde, and dibutyl phthalate (DBP), but did contain camphor. They were made in the USA. American Apparel was founded in Los Angeles, CA, USA by Canadian entrepreneur Dov Charney in 1989. It is a designer, manufacturer, and retailer of the American Apparel line of clothing, and is one of the largest apparel manufacturers in North America. The company remains based in Los Angeles. Oh I’m not an informed customer then! I had no idea about the American Apparel scandal. I DO remember the broken bottle fiasco though. I really dig their bottle design too – slim and perfectly crammable! 😛 Too bad they discontinued their nail polishes, I really liked the creams they offered. Lots of muted colours (oddly enough, for a brand known for their crazy styling), right up my alley! Did you find that the colours don’t seem to mix completely in their bottles? A lot of mine have weird separation in the formula no matter how much I shake it. Even without being fully mixed, they apply fine though. Love this colour! I’ve always liked how narrow these are and how they stand neatly against each other rather than rounded bottles. Never bought one myself but have eyed them several times, American Apparael are few and far between here! Its amazing how long polish can last! That colour looks as good as brand new.